Staff photo by Erin O. Smith / Water, with sewage mixed in, leaks onto the path of the Champions Golf Course near the Snow Hill pump station in Ooltewah last November. Is bill catalyst for wastewater fix? At first flush, it might seem a good temporary compromise that state Sen. Todd Gardenhire, R-Chattanooga, and state Rep. 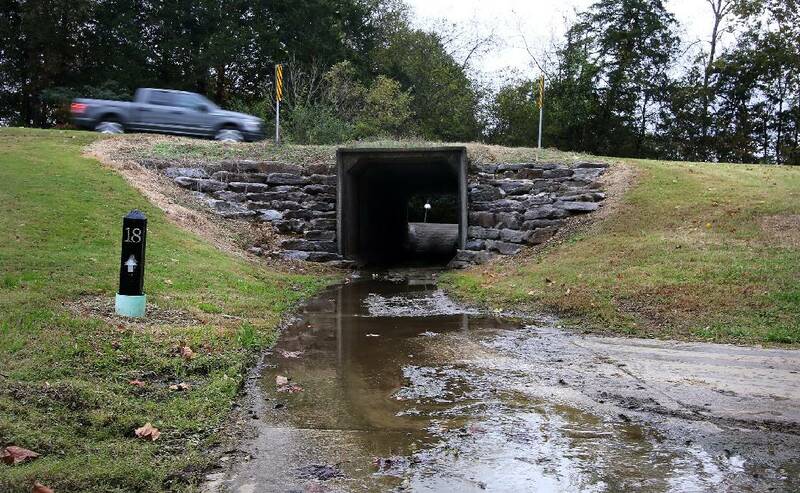 Patsy Hazlewood, R-Signal Mountain, are trying to help the Homebuilders Association of Greater Chattanooga find a workaround to the Ooltewah moratorium on new sewer connections. The moratorium, prompted by continuing raw sewage overflows in one of the fastest growing communities of our county, is stalling homebuilding there. What's more, the situation looks to have no quick remedy after the latest false start from the county's Water and Wastewater Treatment Authority — a proposed new sewage treatment plant on Mahan Gap Road — met with a community-pressured no-vote from the Hamilton County Commission. But septic tanks are unlikely to help in Ooltewah and more likely to hurt. If, in this lowest elevation area of the county, we already see sewage overflows, what makes anyone think septic tanks with field lines will allow sewage and wastewater to percolate through field lines long enough and far enough not to surface in rainy weather and find its way to creeks or the Tennessee River? There is a reason for the moratorium, and the only thing that will help this part of the county keep growing is to do what we and our government and environmental leaders have known for decades must be done: Extend the sewer lines and pump stations necessary to get all of the waste generated in our current and futures homes carried to Moccasin Bend Wastewater Treatment Plant. There are two reasons why that hasn't already happened. Some of our leaders are still fighting the kind of turf wars that come with debates over consolidated services. And virtually all of our leaders are still stuck in the pay-it-later, rather than pay-it-forward mentality. To Gardenhire's and Hazelwood's credit, their bill includes a clause that would eventually require the septic tanks' owners to hook into a sewer, if and when there finally is one. That's just another can kicked down the road. But the real potential in their bill — which they have written to apply to any area in the state with sewage moratoriums — is the pressure it and heightened state scrutiny places on the county and WWTA to move sooner toward the clear and obvious solution: a connection to Moccasin Bend. Let's finally get this fixed and help Chattanooga and Hamilton County grow. Wildlife biologists and a group of cave enthusiasts found dire news in North Georgia last weekend. White-nose syndrome — a fungus — is continuing to wipe out millions of bats locally and across North America, Asia and Europe. Between the winter of 2007-2008 and the summer of 2018, millions of insect-eating bats in 33 states and seven Canadian provinces died from white-nose syndrome, according to a U.S. Geological Survey. The fungus infects the skin of their muzzles, ears and wings while they hibernate. It causes them to awake desiccated and hungry — but too early in the year to find food. They starve or die of cold. The fungus is taking a toll here as well. In 2014, Frick's Cave in Walker County, Georgia, still had about 1,500 tri-colored bats. The following year, about 75 percent of those bats had visible signs of the fungus, and by 2018, the population had dropped to about 250. A count there this weekend found 141 tri-colored bats, some with fungus growing on their noses. "[The population is] down, it's definitely not good," wildlife biologist Trina Morris told Times Free Press reporter Mark Pace. And it's not just bad for the bats. It's bad for us. "Imagine if we lose an important predator for an agricultural pest," said Mark Urban, an expert in ecology and evolution at the University of Connecticut and author of a 2015 study which postulated that if the world's greenhouse gas emissions continue unchecked, one in every six species on the planet could become extinct. "Suddenly we have a major pest problem that threatens our ability to grow food." We don't have to imagine. If birds are the day shift of insect pest control, bats are the night shift. Without them, we can't apply enough pesticide to save our crops — or our own skins. A recent spate of local police incidents involving excessive force has rightly prompted state lawmakers and Chattanooga City Council members to seek better training and citizen-involved police oversight. State Rep. Yusuf Hakeem, D-Chattanooga, and Todd Gardenhire have filed legislation requiring the state to provide annual training for law enforcement on diversity, race relations and "cultural awareness." Most departments already have such training for recruits and new officers. But few — and certainly not the state — require refresher or advanced courses. Meanwhile in Chattanooga, leaders here bucked a separate state lawmaker push to restrict the power of police oversight boards. Instead, city council members Anthony Byrd, Demetrus Coonrod and others discussed adding a police oversight referendum on the ballot. If Chattanoogans vote in support, the oversight board would become part of the city charter, making it harder for future mayors or police chiefs to scrap it. Both of these efforts are long overdue. Good police officers need all of the help and training and oversight we can provide to help them better train or cull the problem officers who give them a bad name.